Golf Club Brokers has been selling on eBay since 2006 with a 99.9% feedback rating. We are a Platinum Power Seller and a Top Rated seller. We have provided additional evidence of our identity to PayPal by passing key security checks and completing the PayPal Verification process. 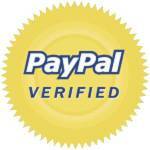 Verification increases the overall security of the PayPal network because most buyers prefer to do business with Verified sellers.